Famous for being the world’s only vampire themed pizzeria, Lost Boy’s Pizza is delighted this Halloween to announce a brand new site, launching in December 2018. 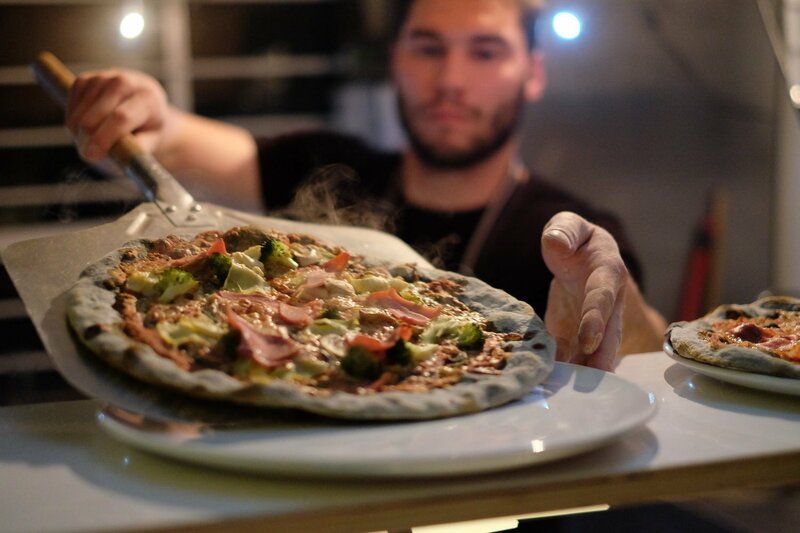 Located on Eversholt Street in Camden, the new venue will feature Lost Boys Pizza’s signature black charcoal pizza, killer cocktails, strictly 80s soundtrack upstairs, while downstairs will be Croque Monsieur – an absinthe bar of epic proportions. The brainchild of long term friends, collaborators and London hospitality experts, Alex Fisher and Peter Crozier-Clucas, Lost Boys Pizza is a neighbourhood pizza hangout that celebrates everything the 80s did right. With its airy Californian design, a hint of geek-chic, and a killer menu of black pizzas, the pizzeria soon became a cult favourite when it launched in Archway in June last year. Situated at the Mornington Crescent end of Camden High Street, the new restaurant will take inspiration from the Frog Brother Comic Book Store in the Lost Boys film. Expect neon, big windows, a brass panel bar top and a wood grain table all against a rich blue palette. An enormous statement cocktail umbrella lamp will take pride of place in the window and custom iron shelving will hang behind the bar, while an open kitchen at the back of the restaurant will be a hotbed of charcoal pizza creation. Continuing to shun single-use paper, Alex and Peter have instead opted for a menu on the walls, which will be thrown up by local artist Isabella Farfan. The ceiling will be adorned with black and white comic book pages, and the walls will feature framed vintage comics from Alex and Pete’s collection. Outside, a 45 cover garden with a retractable roof and heat lamps for winter will be the perfect spot for al fresco style pizza throughout the year. Crammed with plants and boasting a slushy margarita machine and the promise of a paddling pool for the warmer months, this will be a fun and sun-filled spot like no other in London. In the basement of 245 Eversholt Street is Croque Monsieur, a brand new Absinthe bar that invites Londoners to have wild and wonderful times with absinthe. In this tiny basement bar, absinthe is taken from its dark history and catapulted into London’s present as the world of this mysterious and potent green liquid is opened up to connoisseurs and newcomers alike. As they head down the iron staircase, a stained glass window will allow guests a sneak peek into this green-tinged absinthe den before ringing the bell for entry. Featuring absinthe fountains on each table, church pews as seating and Art Deco prints on the wall, Croque Monsieur will offer an extensive range of brands, from reversed engineered liquids to more traditional names, meaning guests will be able to enjoy absinthe in its purest forms, as well as in delicious and approachable cocktails. Add to this a dressing up box with compulsory hat wearing and swapping and Croque Monsieur is set to be London’s most unique, most fun bar, ever. With combined 40 years-experience in hospitality, Alex Fisher and Peter Crozier-Clucas met twenty years ago while working at TGI Fridays and then spent their formative years working for such brands as Hard Rock Café, Planet Hollywood, Wahaca, The Living Room and Giraffe before climbing the management ranks to oversee branded restaurant operations and expansions in the UK and abroad and developing a reputation in consultancy. Believing strongly in educating Britain’s young people about the benefits of a career in hospitality, Alex and Peter set up Lost Boys Pizza to combine their love of 80s nostalgia with a desire to create a fun and friendly space that’s all about great pizza and great drinks.